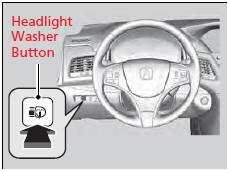 Turn the headlights on and press the headlight washer button to operate. The headlight washers also operate when you turn the windshield washers for the first time after the power mode sets to ON. The headlight washers use the same fluid reservoir as the windshield washers.